It’s a classic story: husband and wife, weary from their fast-paced careers, leave behind the big city to open a small guesthouse in an idyllic setting. Except in this case, the major players, and their past careers, are of particular note — the husband was a big-shot record exec at Sony whose prior position required (allowed?) him to go on the road with rock stars, and the wife worked as a travel writer. 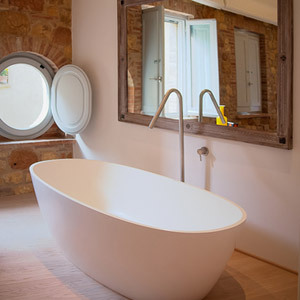 In other words, their new La Bandita Townhouse, younger sister of the original La Bandita villa and located in the historic center of the small Tuscan town of Pienza, is no mom-and-pop operation. It’s a youthful, thoughtfully executed and thoroughly hip getaway that blends rustic village charm with urban savoir faire. 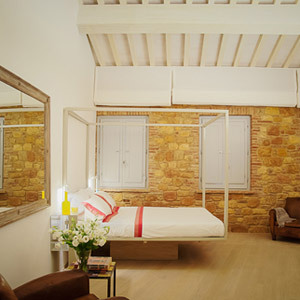 Housed inside a Renaissance-era palazzo that served as a nunnery for hundreds of years, this twelve-room boutique has a modern edge — cool all-white furnishings, impeccable parquet floors, minimalist bathroom fixtures and a sophisticated lighting system. But the owners are proud to point out that they didn’t change the timeworn façade, nor tack on any additions to the original structure. Instead, they gutted the nuns’ cells to create airy, loft-like guest accommodations. They left the exposed stone walls and wood beam ceilings, but added stark white décor and clean lines, creating a sleek aesthetic you’d sooner expect to find in Milan than in a tiny village in Tuscany. In both the guest rooms and the welcoming library, the old softens the new; you’ll be tempted to curl up on that angular sofa and help yourself to a drink from the honor bar. The Townhouse Caffe veers more towards the contemporary, with a smart wine list, stainless steel kitchen, and daily specials spelled out on a chalkboard, while the leafy interior courtyard seems a remnant of the past. If you’re seeking a little more of that old-fashioned Tuscan charm, just step outside the Townhouse onto the old cobblestone lane, and you’re in the heart of a UNESCO World Heritage Site, the 15th-century village of Pienza. 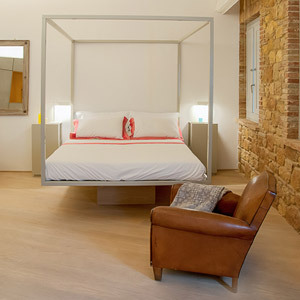 La Bandita Townhouse is located about 90 minutes from Florence, 2 hours from Rome, or 2.5 hours from Pisa. The nearest train station, Chiusi-Chianciano, is 45 minutes away.